Completed in 1618, the four-hundred-year-old Walls of Derry hold centuries of tales and sagas within and today is the only intact walled city on the islands of Ireland and Britain. 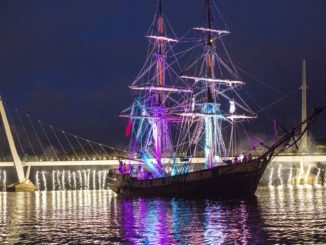 I’m standing on the banks of the River Foyle waiting in anticipation with thousands of others as a parade of lighted ships sail down the river to the Peace Bridge. The man standing beside me is huddled next to the rails. “I’m stuck here like jam,” he quips in his Derry Brogue. 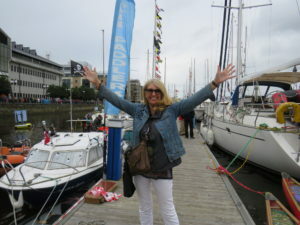 I’ve been in the city only a few hours and I’m overwhelmed by the festive atmosphere at the Foyle Maritime Festival. The mood is jovial as families enjoy the stalls filled with chocolate dipped strawberries, bratwursts and waffles − all you’d expect to see at a Christmas market. 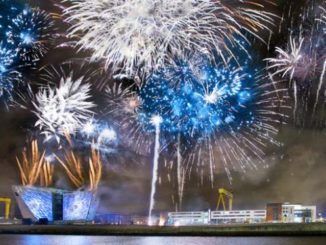 The story we are about to watch is entitled Voyages and encompasses pirates, dancers and musicians in a display of light and fireworks. 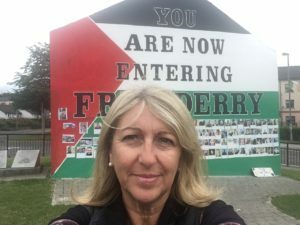 I’ve travelled this year to Alabama and to South Africa and I’m deeply moved by places with a strong message and story that the discerning traveller can learn from. 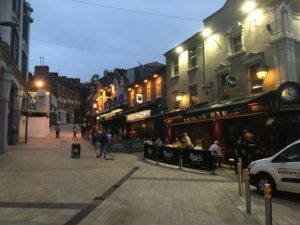 Derry has several tales to tell and I start my discovery next day at The Siege Museum situated next to The Apprentice Boys Hall on Society Street. Living in the South of Ireland I’d heard about the Apprentice Boys on the news as I was growing up. I’m put straight about their history by Stuart Moore who has lived his entire life on the dominantly protestant Fountain estate, and is curator of the museum. 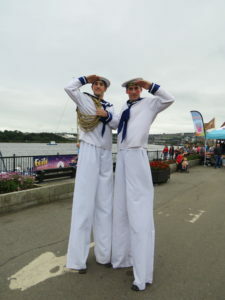 Being a deep water port Derry has always been a strategic base during wars, including WWI and WWII. This was especially the case in 1688 when Catholic King James II sought to take his thrown back in England and in the process regain the territories of Ireland and Scotland. The Governor at the time, Robert Lundy, was keen to accept James in return for the protection of his citizens. In history he is written down as a traitor for turning away aid and preparing the city for surrender. However Henry Baker and George Walker oversaw the defence of the walled city. Led by Henry Campsie a group of thirteen young apprentices to London businesses closed the gates to the cry “no surrender”. The siege lasted 105 days and in that time the population of 25k inside the 29 acres was cut by one third due to starvation and disease. Every year a twenty feet tall effigy of Lundy is burned on the first Saturday in December which for the past 25 years has been made by the same members of the walker family from the fountain estate. The crimson clad Apprentice Boys (not to be mistaken with the orange order) then march to St Columbs Cathedral where a service is held helping me understand the purpose of this tradition which was a source of conflict in the twentieth century. “Many suffer so that someday the future generations may live in justice and peace” enforces my first impression and the significance of two societies oppressed by a form of apartheid. I walk on to the site where once the Roswell Flats stood but is now the Museum of Free Derry. Here I meet with Jean Hegarty, a guide at the museum. Her brother, Kevin McIlhinney was one of the thirteen people killed by British troops on January 30th 1972 − Bloody Sunday. Inside I’m moved by the images and memorabilia associated with the civil rights marches which were instigated with the premise of equality for all the citizens of Derry. After the formation of the Irish Free State in 1922 conditions remained bleak for the catholic community in the six counties. In the 1960s to have a vote a Northern Ireland citizens had to be 21 however business owners who were dominantly protestant were entitled to several votes dependant on personal wealth. 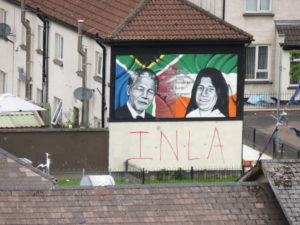 With high unemployment and a lack of social housing and little voting power, the Catholic minority lived in a state of apartheid: hence the slogan ‘one man one vote’ for equality in jobs, housing and education. Demonstrations initially were based on the peaceful civil rights campaigns seen in Alabama at the time orchestrated by Martin Luther King, and members of the protestant community came out in support. This however turned antagonistic after Harold Wilson deployed troops and instigated internment in Ulster in 1971. The rest is history but a painful one that resonates in places today such a South Africa and Alabama − lest we forget. 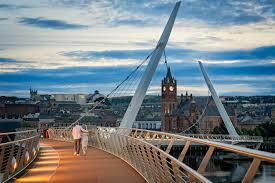 Hope sprang across the Foyle in 2011 as the Peace Bridge was completed and the troubles reconciled. It has since been trod by The Dali Lama, Bill Clinton and Martin Luther King III. Designed to link the two communities it leads to Ebrington Square which was once the barracks for the British army during ‘The Troubles’. Now it houses The Walled City Brewery which is the only brewery-restaurant in the one location in Ireland. I met with the owner who has great hope for continued development of the site which boasts the best views over the Peace Bridge and the walled city. That evening a classical concert plays and the Peace Bridge is doing its job. I gain a different vantage point of the bridge next day as Inishadventures offer canoe trips along the river passing underneath and flanked by the rail tracks on one side and walled city on the other. I can’t leave Derry without walking the walls and Martin McCrossan tours have been educating visitors for over twenty years. The lovely Sorcha Bonner is my guide and she talks me through the history with in-depth tales of the siege when citizens ate the carcasses of rats and dogs which in turn had feasted on the bodies of the dead. We pass by St Colms College where notable alumni include Seamus Heaney, Brian Friel and John Hume. Next a panoramic view of the Bogside and home to Dana musical success who stole hearts at the Eurovision Song Contest in 1970 with Ireland’s first win. 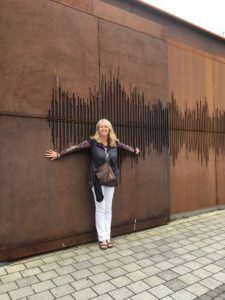 Sorcha makes this walking tour one of the most entertaining and informative I’ve enjoyed in any city in the world. 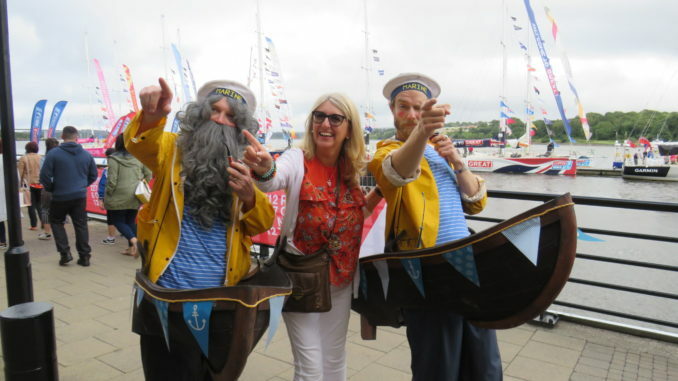 Before I leave I catch up with the end of the Maritime Festival as the Clipper ships make their way onto the last leg of their journey to Liverpool. I’ve been moved, enthralled, thrilled and amused by the tales and charm of its inhabitants. 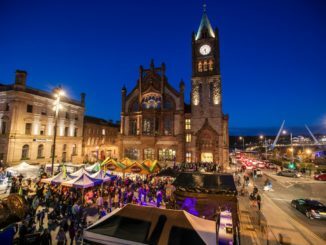 Derry is a city filled with history and hope and only three hours from Dublin it makes an easy destination to explore over a weekend. No wonder Phil Coulter referred to it as the ‘Town I loved so well’.